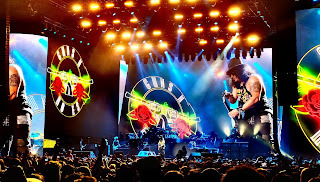 Guns N' Roses' Not in This Lifetime reunion tour with Slash and Duff McKagan continues to produce incredible figures in testimony of GNR's rarified place in rock and roll history. The tour has made a little over 140 stops at arenas, stadiums and festivals around the world since kicking off in 2016. All those shows mean GNR has performed for some 5 million people over the last two years, reports Live Nation. Earlier this summer, Guns N' Roses broke Metallica's record for concert attendance in Sweden and became the most-viewed band on YouTube to come out of the '80s or '90s. The tour is coming to an end this December as the band takes its bows in cities in Asia and the Pacific. After that, everybody but Slash will take a vacation, then the band is expected to consider putting some new music together. GNR's most recent release was the Locked N' Loaded special edition box set to celebrate the 30th anniversary of its groundbreaking debut album, Appetite for Destruction, which rocketed back into the top 10 on the album charts this past summer. The band's last new music release was 2008's Chinese Democracy, or what Slash has referred to as "Axl's album."